I survived the weekend and it was phenomenal. I had an experience of a lifetime. Who knew my lil ole hobby of painting nails would one day become lucrative? Work never feels like work when you love what you do! 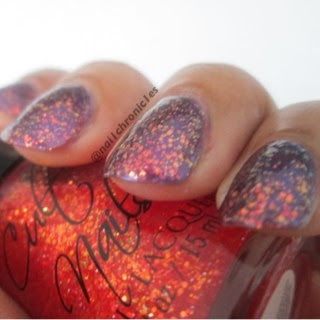 Today I have another beauty from Cult Nails, Captivated, and it is captivating!!!! 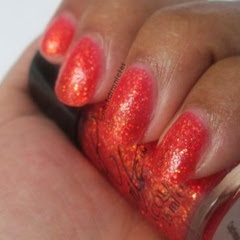 Captivated is a beautiful coral, reddish jelly jam packed with red and gold glitter. See more pictures, layering options, and Captivated with a matte top coat after the break. This is 2 coats of Captivated alone. It really does hold its own weight by its self. I broke out the Essie's Matte About You top coat, not sure why I did but I'm glad I did because hunnnnnnnE....YAS!!!!! You can see how the glitter just takes her bra off and let's it all hang out! ﻿﻿Next I have 1 coat of Captivated over Essie's Peach Daiquiri, which happens to be one of my favorite coral polishes. These two are a pretty close match so no awkward color changes to note. I saved the best for last. This is my favorite way to wear Captivated. I layered 1 coat over 2 coats of OPI'S Into The Night, which is a very pretty purple. This combo really makes the glitter pop. I put a matte top coat on this one too. Love, love, love! 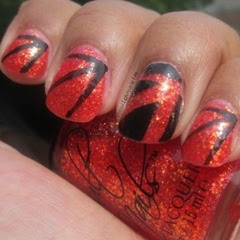 ﻿﻿ I also got the tape out and did I little tape mani on about the 3rd day to prolong the wear of this beauty. yes!! I was totally surprised when I got it over that purple and it went straight flakie style on me.